Goal: Army Surface Deployment and Distribution Command at Fort Eustis, Va., needed a way of monitoring environmental conditions, such as excessive heat and humidity, in its operations center computer rooms. Obstacle: The solution had to be quick and easy to deploy, without introducing an entirely separate system that runs parallel to the command's other IT management systems. It also had to be flexible enough to handle additional monitoring tasks. Solution: Paragon Systems proposed IP-based monitoring from NetBotz Corp. The NetBotz solutions take surveillance camera and environmental sensor data and send it over an IP network. The system can send alerts automatically via e-mail, text message, cell phone or other method. Payoff: For Paragon, the NetBotz solution adds value to IT infrastructure projects. Staff at Fort Eustis can now react quickly to environment threats to its IT assets. The command will now deploy wireless monitoring devices at ports to key an eye on shipbound materiel. NetBotz CEO Tom Goldman said about 80 percent of the company's systems are used for monitoring IT infrastructures. When chasing IT contracts, it can be hard to make one proposal stand out from the rest. Server consolidation, disaster recovery and similar technology initiatives are fairly well understood and not very glamorous. But Gary Newgaard, president of Paragon Systems LLC of Herndon, Va., said his company has found an emerging technology that adds considerable value to the IT work it does for government customers. Under a Defense Department task order, Paragon is installing Internet protocol-based physical security solutions for the Army Surface Deployment and Distribution Command at Fort Eustis, Va. The systems, developed by NetBotz Corp. of Austin, Texas, let government agencies monitor the physical conditions around their critical infrastructure while they protect the data that travels across it. "This kind of technology should be a key component of any agency's disaster recovery planning," Newgaard said. The Surface Deployment and Distribution Command, a component of the U.S. Transportation Command, moves everything from troops' families to military materiel around the world. Its Fort Eustis operations center has six server closets and one large computer room for running the command's IT infrastructure. Last year, the operations center had an unforeseen IT problem. "We had some freak flooding in one of our computer rooms and didn't notice it until the next day," said Rose DuBose, senior technical adviser at Fort Eustis. Although the damage wasn't catastrophic, DuBose and her staff needed an easy way to monitor the physical conditions in and around the computers. 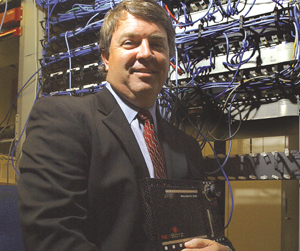 At the time, Paragon Systems was at Fort Eustis installing network equipment, and it pitched the NetBotz solution. "Continuity of operations initiatives is driving agencies toward this solution," said Tom Goldman, NetBotz's chief executive officer. "Few agencies view their infrastructures as anything other than critical." The main component of a NetBotz deployment is the NetBotz 500 monitoring appliance. It's about the size of a laptop computer, and has a central processor, digital motion camera and sensor module. The built-in module detects humidity, temperature, airflow and noise, but it can accept virtually any third-party sensor through one of its USB ports, Goldman said. NetBotz recently contracted with RAE Systems Inc. of Sunnyvale, Calif., to support RAE's sensors, which include biological and chemical agent detectors, among others. The NetBotz 500 can be attached to a wall or slipped into a server rack. It communicates with a rack-mounted NetBotz Central command server via Ethernet or wireless connection (802.11 or GSM/GPRS). The more devices deployed, the more it makes sense to consolidate data on the NetBotz Central server running the company's management software, Goldman said. But each monitoring appliance has a built-in, IP-addressable Web server, so IT staff can use any Web browser to check on it without needing that additional server. When the NetBotz 500 detects a threat, it sends alerts through user-defined channels, including e-mail, text messages or cell phones. In addition, the unit's camera captures video only when it senses a problem. This helps minimize bandwidth usage and data storage needs, DuBose said. Because the NetBotz solution uses IP, Fort Eustis staff can monitor the conditions in its computer rooms over the same network it uses to monitor the health of its data. All network traffic and alerts use Secure Socket Layer encryption to protect information. The command piloted a pair of NetBotz 500 appliances for 90 days, DuBose said. Now, Paragon is installing four permanent monitoring units and the NetBotz Central server in the operations center. The command also decided to expand its use of NetBotz beyond the computer room. When the Defense Department has to move people or materiel overseas, the command often collects cargo at commercial ports for loading onto ships. That cargo can sit on a dock for several days, largely unmonitored. DuBose said the command has bought three additional NetBotz units for keeping an eye on soldiers' equipment, which can include food, clothes and weapons. Paragon's Newgaard said the NetBotz solution is a minor, incremental cost to IT contracts. For example, the NetBotz solution for the Army Surface Command cost only $150,000, including integration services. NetBotz has sold thousands of monitoring appliances to the Transportation Security Administration, Goldman said. Other customers include the Treasury and Transportation departments, National Institutes of Health, NASA and Federal Aviation Administration. Goldman said about 80 percent of the NetBotz deployments are for monitoring IT infrastructures, but more agencies are using the products for other purposes, such as detecting threats other facilities. "In labs, like at the Centers for Disease Control and Prevention, this kind of monitoring is critical," he said. "That's a scientist's life work in there."